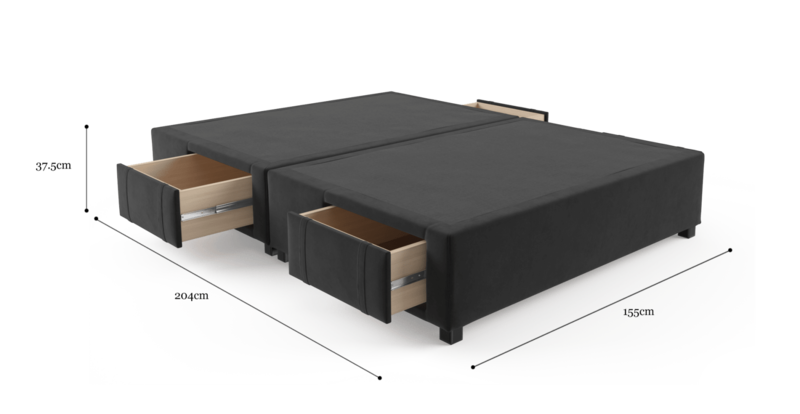 The Queen Size Standard Upholstered Bed Base with Drawers is a storage lovers best friend. Practical. Beautiful. With four spacious drawers that tuck easily into the design. See more bed base designs. Whatever your room interior, there's a bed base to suit. We've chosen a range of colours and fabrics for you to choose from. Everything from reds and purples, to beiges and blacks. Pair up your bed base with any design from our bed head collection. There's something for everyone on offer, from classic to contemporary. The frame is built from solid timbers. Strength tested, it offers all the mattress stability you need. You'll be sleeping soundly every night. Can this product split and used as two single bed bases? I'm extremely happy with my purchases and the delivery and support of your staff to my enquiries. I love my new furniture . Order processed very quickly. Delivery was handled very efficiently. Very happy with the furniture, thank you. Excellent range, product quality and delivery process. Just furnished our new apartment with furniture from Brosa. Looks great! See, touch and feel our fabrics used on our Queen Size Upholstered Bed Base with Drawers. For Free! Simply select up to 3 fabrics and add them to your cart. Delivery is on us.